Zillow was featured during the Amazon Fire Phone keynote by Jeff Bezos today in Seattle. We’re pleased to be a launch partner with Amazon and excited to see what they have in mind for their growing ecosystem. I also now have a (little) experience with making 3D logos in Maya, and I’m interested in learning more. 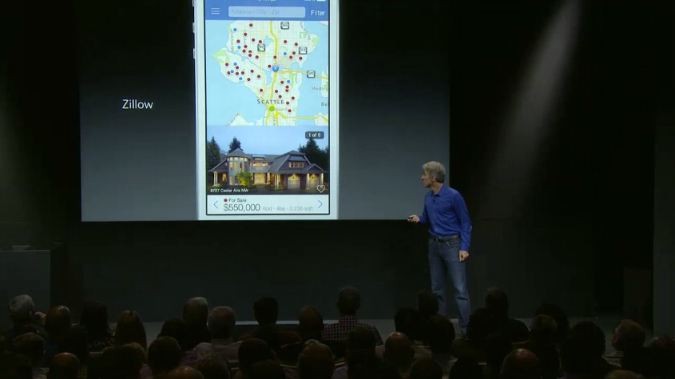 Last week at Apple’s latest iPhone announcement Zillow was a featured partner for the iOS 7 launch. I was fortunate to be part of the team responsible for this major overhaul of the Zillow iOS app and couldn’t be more proud of the work we were able to accomplish on such a strict timeline. iOS 7 represents a major overhaul for Apple as well as Zillow. We were able to strip our app down to it’s essence while adding new methods of interaction and immersion for our users. We are very excited for the new iPhone and iOS 7 in general. We look forward to the upcoming launch from Apple and hope our users appreciate all the work and design thinking that went into this latest release. In the whole history of internet startup culture there are only 24 publicly traded companies that are worth more than $1 billion. The Shape of Design by Frank Chimero is a special book about a special group of people. Designers are often misunderstood; by our peers and ourselves. This book is an honest, careful exploration of what it means to be a designer in the 21st century when mobile, iPads, webapps and other emerging technologies rule the day. Being a designer is not an easy job, as I’ve noted in this blog before less than 30% of designers make it longer than 5 years in the industry. Passion quickly stalls when confronted with the professional drudgery and cynicism that comes from shipping compromised projects we neither initiated or guided to a spot we were satisfied with. The Shape of Design reminds us of the dignity of design and the importance of taking the time to carefully build something that untold humans will interact with. In our digital era the reality is we often design for a global audience, and that to me is a staggering thought. Almost everything we interact with on a daily basis was designed by someone, and we as designers are part of this long line of craftsmen and artisans. The Shape of Design encourages us on our journey and helps us to remember the incredible privilege we share by being called to shape the world for our fellow humans. Back during the crazy days of 2010 I was fortunate enough to work at one of the hottest mobile shops in the country – Übermind in Seattle. Business was not just booming, it was insane. A company that had existed at a low level (head-count wise) for 10 years boomed from 30 to 180 people in approximately a year and a half before being acquired by the consulting wing of Deloitte and assimilated into their global head count of over 160,000. If companies had slowly started thinking about apps in 2008, they were absolutely freaking out about them by 2010. To say we had to turn business down was an understatement. My talented co-workers turned around apps for the biggest companies in the world in a matter of weeks but we weren’t allowed to talk about the majority of them. At that time major companies did not have the in house resources to produce apps but they did have the money and the desire so we did amazingly well for a time. Not unlike the early days of the web, I had a feeling these companies would eventually be able to build up their own resources and as 2011 came to a close it was already starting to happen. Many of these teams were simply small shops like ours that were acquired and brought under the mega-corp umbrella (Small Society etc). As the independent shops were locked up one by one the app stores reached unheard of numbers of apps and the saturation point made it harder and harder for a small team to make an impression. I remember the first time I saw EA drop all their app prices to .99 and take over the entire best seller list for games on iOS one weekend. And it’s only gotten worse since then. From now on success is going to take more focus, more time and more money. With average app prices steadily moving lower and the freemium pricing model decimating the gaming industry it’s daunting even thinking about releasing a successful app. It’s time as an industry to realize things have changed and we’ve lived through an amazing transition but building real businesses now is going to take a lot more work. Startups who released a new app in 2 months are going to need to figure out a strategy that extends beyond a single platform into an entire ecosystem like Evernote, Dropbox, and others. Novelty apps are dead or dying and the “I have a great app idea” people will soon be moving on to something else. As for my former colleagues at Übermind they are now pitching against the biggest consulting firms in the world as Deloitte Digital and there is no doubt the field has grown fiercely competitive. Mobile is now mainstream and every major corporation in the country has an app strategy and is furiously revising their IT infrastructure to allow personal iPads and other devices into the fold. I’m incredibly thankful that I got to experience this wild ride. I missed the first bubble but co-workers who lived through it said our parties almost matched theirs – something that should perk the ears of any tech worker. We had a lot of fun and that spirit of changing the world was like electricity in the air. But those days are mostly over, and the industry is reaching maturity. Pretty soon mobile will be as exciting as Sharepoint and Oracle implementations, in fact it’s closer than most people even want to think. Now in late 2012 as the dust is finally settling its time to get back to the basics by building a company that provides value to the customer. Support all platforms, have a real revenue plan, and build a real marketing department. Mobile devices have opened up amazing new opportunities but as the devices reach a saturation point, the businesses that will last are the ones that realize some things never change, even when everything does. As UX designers we have many tools at our disposal. Many of them are considered best practices and there is no controversy regarding their use. Other tools may be acceptable in some circumstances but not in others. Some cross the line and should be considered Black Hat. What is Black Hat UX? The term Black Hat is usually associated with security or SEO but it does apply equally well to the UX industry. Black Hat UX is anything that subtly and subversively sets out to influence the user to do something they really don’t want to do. Classic examples include email lists that are easy to sign-up for but hard to unsubscribe from. As UX Designers we are called to be the protector of the end user and when we choose Black Hat techniques we are letting them (and ourselves) down. Many companies practice Black Hat techniques but I would like to call out Amazon.com, one of my hometown companies, for a recent example (they can take it). Until today when making an MP3 purchase on Amazon.com users were given the option of downloading the files directly or storing them on the Amazon Cloud Player for later playback. Over several months I have watched as the link to download directly was made smaller while the banners promoting the Cloud Player grew larger and larger. Each time I was able to ignore the Cloud Player option because it was not what I was interested in as my music is handled by the Apple iCloud solution. But this morning when I went to download a new album the option to download directly to my computer was gone. My only option was to save the purchase to the Amazon Cloud Player and then use that to download the files to my machines. It’s hard to blame the designer who just wants to succeed and do well in their job. I’ve been in situations like this myself and the reality is sometimes short of quitting your job there is no way out. That’s unfortunate. What if instead of removing a previously available option the Cloud Player was promoted with a free music offer? If the Cloud Player solution truly is best for the user as Amazon likely believes it should win out in the marketplace on it’s own but there is nothing wrong with positively encouraging that behavior to help it off the ground. As an industry we would do well to realize we have a lot of power over how customers interact with our companies goods and services. Many of these powers are positive but many can be abused for goals that do not serve our users. When short term business needs overshadow a quality UX design the irony is the business is the one that ultimately suffers. The user can walk away and find what they need from other providers. The business then must acquire new customers which is much more expensive than keeping (and pleasing) the ones who already know about and use your services. The bottom line is that there are no shortcuts that won’t come back to bite you in the end. Quality UX is the only goal worth pursuing that will fulfill business and user needs long term. As the designers of these interactions it is up to us to fight these battles. Let’s encourage one another to stay accountable and say no when it is appropriate. Our companies depend on it.